2-oxoglutarate oxygenase/decarboxylase is an Ethylene Forming Enzyme (EFE) from Pseudomonas Siringae pv, that catalyzes Ethylene biosynthesis from 2-oxoglutarate. The enzyme was inserted in the xylose inducible vector pSBBs4S-Pxyl constructed by the LMU Munich iGEM team 2012 for expression in Bacillus subtilis. This part was cloned by the iGEM Trento 2013 team for the creation of an aerobically engineered pathway for the control of fruit ripening. Further information about this part and its characterization can be found in the iGEM Trento 2013 wiki. If interested in this part please contact us. NOTE: We used a modified WORKING version of the pSpac vector that has been sent to us from the LMU Munich 2012 team. Cells were induced with 1% of xylose. The graphic shows that the induced samples (blue trace) grow slightly slower than the controls (red trace). Detection of sulfur compounds. 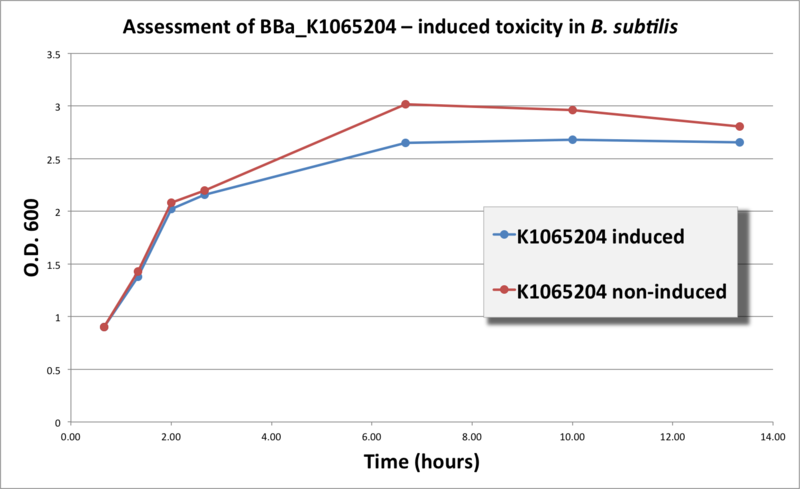 B. subtilis 168 transformed with BBa_K1065204 were grown until O.D. 0.9 was reached. At this O.D. one sample was then supplemented with 1% xylose. Cells were left to grow overnight into vials containing a lead acetate strip. 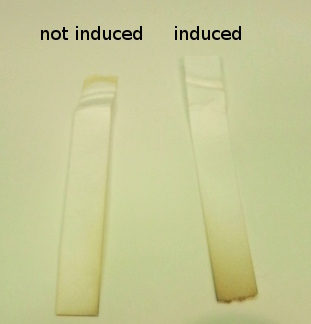 The day after, transformed and induced samples showed a darker strip indicating the presence of sulfur compounds. The non trasformed cells supplemented with the inducer did not show that precipitate (see our wiki and also this part for more informations .) The induced sample darkened much more than the not induced indicating the presence of sulfur compounds.